As we turned down the street to Nancy Reilly’s house and studio, we knew immediately that we had arrived, even without searching out the street number scrawled in our notes. 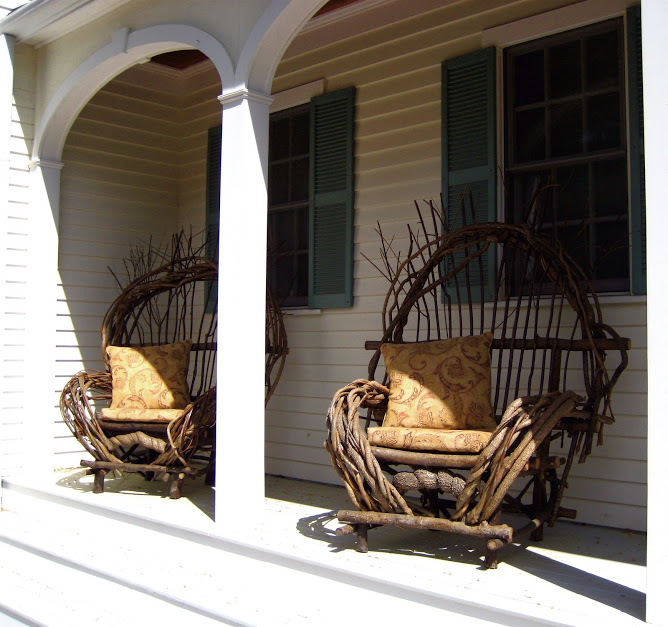 The street-facing porch boasted two comfy, twining chairs and a door decorated with a large, looping wreath of bittersweet vines. Driven by a strong do-it-yourself attitude and a passion for repurposing invasives, Nancy has spent the past eight years exploring the endless uses of Asiatic bittersweet in both furniture building and home décor. A tour of her home reveals a hand-made piece in almost every room, yet they blend into the overall furnishings so well that each piece comes as a surprise when she points it out. 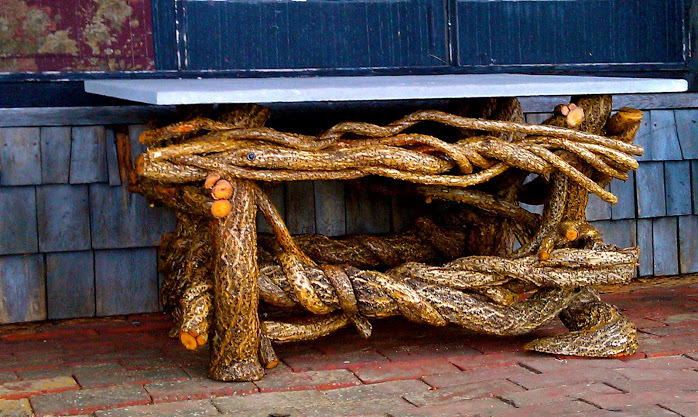 Bittersweet vines stand alone to create mirror frames, window swags, and dainty nests, or are paired with granite and other stone to provide sturdy tops for benches and tables and bases for lamps. Each piece is full of the charm that comes from individually handcrafted art. In describing her creative process, Nancy agrees that each creation is different because her stock of materials is constantly changing. No two vines curve and coil in exactly the same way. While this unique quality of the material is what now lends whimsy to each construction, initially the irregularies of bittersweet provided a major obstacle to the novice woodworker. When Nancy first turned to furniture making, she took a traditional woodworking class. 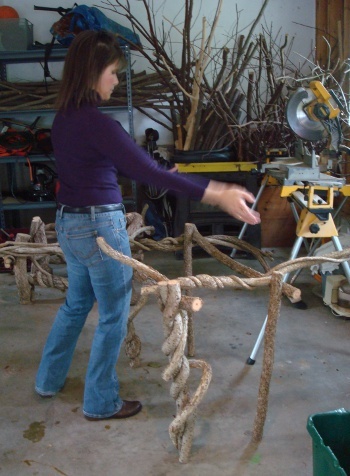 After learning the basic skills she wanted to explore use of atypical materials, such as bittersweet vine. Told that such materials would never work in furniture making, she started experimenting on her own. Her initial attempts were indeed doomed to become firewood; however, over time she learned to work with the material and treat each creation as a puzzle, trying and retrying different segments of bittersweet until the pieces converged into an aesthetic and stable structure. 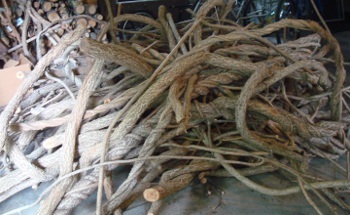 The bittersweet vines that star in the majority of Nancy’s furniture are culled from local conservation areas, mostly by Nancy herself. When harvesting, Nancy cuts out the midsection of the vines, being careful to avoid the berries, the removal of which is illegal. Several conservation groups have granted Nancy permits to remove bittersweet. While these permits allow Nancy to supply herself with plenty of raw material, she admits that the permit process may be a hindrance to other artisans who wish to work with invasives such as bittersweet. The end of year reports required for the maintenance of harvesting permits would prove very difficult for groups such as schools, who could otherwise educate students as to the importance of removing invasive flora to protect native species, while also providing inexpensive material for woodworking classes. Despite the inconvenience of the strict rules surrounding the removal of invasives, Nancy hopes that more people will find uses for invasive species such as Asiatic bittersweet. Her own bittersweet furniture business demonstrates that creative uses for invasive species can indeed flourish.